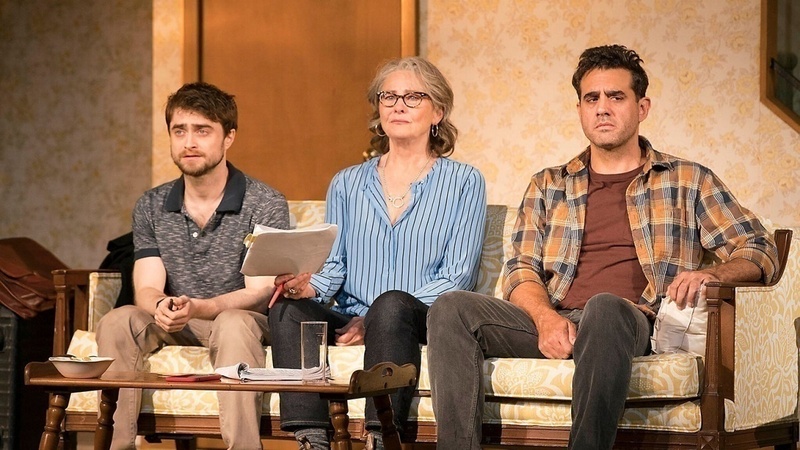 Daniel Radcliffe, Cherry Jones, Chaz Palmatieri. Photo by Peter Cunningham. Fake News - Truth or Fiction? Reflecting the current political atmosphere, a world premiere play, The Lifespan of a Fact, assigns Jim Fingal, a magazine intern, as fact checker for an essay by John D'Agata, a well-respected writer. Fact-based on a book by Fingal and D’Agata, (the original Jim and John), this stage version makes for a provocative 85 minutes following a fact-versus-thesis match at Studio 54. Adapted by playwrights Jeremy Kareken, David Murrell, and Gordon Farrell, the article, or "essay," as John prefers, concerns the 2002 suicide of 16-year-old Levi Presley from the roof of Las Vegas' Stratosphere Hotel. Emily Penrose (Cherry Jones), editor at a prominent literary magazine, gives Jim (Daniel Radcliffe), a Harvard-educated nitpicker a five-day deadline to check the essay's veracity. "It’s your job to see the rational detail." she says. "No problem," Jim insists, eager to impress Emily, and then he starts to read the essay, word by word, and finds inaccuracies, many of them. When he begins insisting on the discrepancies of the first sentence, it seems improbable that he will make the deadline. He emails the writer, John (Bobby Cannavale), who is considered by some as, "one of America’s most significant living writers," suggesting improvements. "Not a chance," says John, insisting that changing anything, even the number of Las Vegas strip clubs from 34 to 31, is unacceptable. He refuses to bow to the petty issue of facts. What John is writing about is the beauty of the truth. Factual demands are secondary. "I take liberties with things that deepen the central truth of the piece." John is inflexible. On the other hand, to describe Jim as insistent is an understatement. He is a stickler in preserving the factual integrity of the article. Emily, who just wants the piece fast-tracked for publication, finds she must insert herself between the two. With Cherry Jones' (Doubt), commanding authority, Emily becomes exasperated. When Jim flies to Las Vegas to persuade John to make changes in the essay, she knows the deadline is in trouble. The situation demands her presence there to find a give and take for both Jim and John. Director Leigh Silverman keeps this slight but significant story moving compellingly along with excellent performances on Mimi Lien's versatile settings. Cannavale (The Hairy Ape) is convincing with his imperious self-confidence. He has done his work with this essay, meeting the victim's parents and forming a bond with them. "I don't know if he took the stairs or waited for the elevator from the garage but...but I walked in his footsteps." Adapting anything for Jim's factual depends would be letting the boy's family, and John's own essay down, and embroidering the facts are sometimes necessary to get to the sensitivity and inner truth. This is clear to him. "It is not a crime to find the music in a boy's life." "People's lives aren't chord progressions you can rearrange at will." Radcliffe (The Cripple of Inishmaan) shows impeccable timing as he evokes Jim's maddening inflexibility. You begin to wish he would just let a few of the facts pass but he is relentless in his job and he is, after all, correct. Around this efficiency is an unmistakable charm. How about keeping The Lifespan of a Fact running for the next two years, considering the way facts are tossed in the air to fall like jigsaw puzzle pieces. No real conclusions here, although both sides offer fast-paced opinions. It is an engaging work, well-staged and beautifully performed by three extraordinary actors, and that is a fact. Running time: One hour, 25 minutes. No intermission.